Halifax lost a second successive game against Super League opposition in the Super 8s Qualifiers as a hat trick from Josh Mantellato secured a Hull KR victory at New Craven Park. The Challenge Cup finalists ran out 34-12 winners, reflecting the fact they looked a far sharper attacking proposition than Widnes Vikings had done in week one. In a game that looked like a carbon copy of the one against the Vikings, Fax were full of courage and endeavour and at times presented a definite threat to the Rovers defence. The big issue, again, was that they made too many errors - especially trying to escape their own territory - to be competitive for long enough to really put Chris Chester’s side under the cosh. The visitors looked marginally off the pace set by Rovers early on and paid a high price, conceding two early scores. 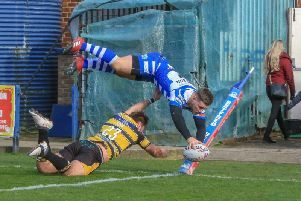 There were five minutes on the clock when Australian winger Josh Mantellato crossed in the corner after a penalty left Fax on the back foot. Mantellato couldn’t convert, but was on target after 10 minutes when Rovers captain Tyrone McCarthy rumbled over under the sticks after another import - dangerous half back Dane Chisholm - beat a couple of challenges on the right. Trailing 10-0, Fax began to work their way back into the contest and got their reward just past quarter time. Scott Murrell almost had Ed Barber over the line, but his cross kick on the next play was palmed back by Steve Tyrer and Dane Manning collected inches inside the dead ball line to touch down. Tyrer converted, but while the visitors continued to threaten, they also continued to be a little too adventurous in their own half resulting in too much turnover ball. James Saltonstall went close in the corner, but in the end it was Rovers who gave themselves a little breathing space at the break, a couple of marginal penalties pinning the visitors on their own line and Mantellato scoring in the corner before getting up to land the conversion. A 16-6 scoreline looked a little harsh and when Rovers scored again - after another penalty - through Mantellato after 52 minutes, the winger converting, you feared the worst. But this Fax side are nothing if not resilient and they slowly began to look like a team that was beginning to calculate what they need to do to compete in these games. Marshall moved Ben Johnston to half back and James Saltonstall to full back and within minutes Manning and Johnston combined to put Tyrer over, the centre converting to make it 22-12. Suddenly, from being comfortable, Rovers looked rattled and Fax had a golden opportunity on the next set, Manning bursting through but firing his inside reverse pass a little bit too hard for Murrell, who fumbled with two players unmarked outside him. That was probably the chance Fax needed to take and with five minutes remaining Ken Sio dived in to seal Rovers’ victory before Kris Welham’s final-play try, converted by Mantellato, gave the scoreline a flattering gloss.